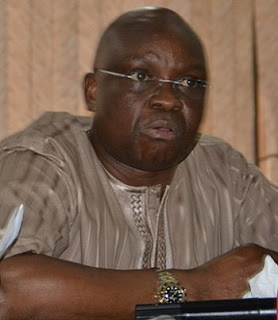 A youth group, the Middlebelt Youth Leaders Forum (MYLF) has raised concerns over what it described as unnecessary inciting statements and attacks against President Muhammadu Buhari by Ekiti state governor, Ayodele Fayose. The youths accused the governor of fanning the embers of ethnicity warning that the inciting statements by Mr Fayose could heighten ethic tension in the country. Addressing a press conference in Abuja, National Secretary of MYLF, Comrade Terrence Kwuanu urged the National Human Rights Commission (NHRC) to censure Fayose and his Rivers state counterpart, Nysome Wike for promoting hate speech with a view to putting them on trial at the appropriate time. He said, "The last quarter of 2016 was full of too many deliberate plots by these ethnic warlords to provoke the peace of the over 250 other ethnic groups. It is an urgent matter that requires demand for immediate caution and restraint as and any further attempt by these persons who have misplaced their offices for the gutter will be rejected with stiff opposition. Their plot is to divert every attention from their inglorious activities of killing, looting, stealing and mismanagement of taxpayers money in their states. He described the recent statement by the governor where he claimed that President Muhammadu Buhari was clamping down on potential challengers in 2019 elections, as one of the numerous instances where Fayose had attempted to instigate attacks against the President. He said, " He had made several spurious accusations in the days and hours preceding his latest attack. Some few days before that Fayose's brother in arms and Rivers State governor, Nyesom Wike had similarly ratcheted the regular insults he pours on the federal government with the claim that there was a plot to bomb his plane. "We observed that these irresponsible comments and behaviour increased in intensity and frequency after a phone recording in which both men were discussing the roles they played in committing crimes, to wit the rigging of parliamentary re-run elections in Rivers state where security agents were assassinated at will on Wike's orders. "The mindless harsh criticisms are apparently aimed at distracting the nation, particularly the people of Rivers and Ekiti states, from the grievous crimes committed by both men and possibly forestall the legally natural retribution of impeachment since their acts clearly breach all known laws and the constitution." Kwuanu said as much as the crude talks by both men may be "politicking" and games to their minds, the MYLF are gravely worried as to the possible consequences of such behaviour on national cohesion and peaceful coexistence even in the short term. He said, "This is because the attacks on President Buhari are often launched in words aimed at stoking ethnic hatred and targeted at being derogatory to persons of particular ethnic extractions. "The veiled hate speech being promoted by Fayose and Wike is already yielding results on the streets where verbal abuses among Nigerians, had cordially existed before now, has spiked. In a few instances debates on the streets over the appropriateness of the duo's actions and choice of words have resulted in fisticuff and it is a matter of time before full blown ethnic clashes break out on account of the mindless irresponsibility of these two supposed leaders."